"I'm new to the competition scene and i don't know what to wear?" Blog "I'm new to the competition scene and i don't know what to wear?" As established competition riders with experience under our belts we automatically know what we can and cannot wear for different disciplines. Whether it is clothing or tack. But what about the new horse owners? Or those who have taken the plunge and decided competing is now for them? Or even those who have returned to the competition scene after time away? Are there are changes? What can you wear? In this week’s blog we look at the three main disciplines of dressage, show jumping and the cross country phase of eventing and what is permitted dress for each one. “The art of riding and training a horse in a manner that develops obedience, flexibility, and balance”. British Dressage advise that alongside a correctly fitted riding hat designed to provide protection, the following must be worn. For advanced tests a tailcoat must be worn with a shirt and correctly tied white or cream stock. For intro to advanced medium a short jacket or a tweed jacket. With a correctly tied stock and shirt. 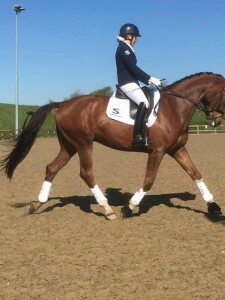 Black or navy are the traditional smart plain coloured jackets that are suitable for the dressage arena. The Tattini Softshell zipped show jacket is ideal as the soft shell material with schoeller stretch fabric make for a comfortable fit. The material has a high level of elasticity. It is also water and dirt repellent. These smart and stylish jackets offer a flattering feminine cut. They are also suitable for machine washing. Breeches must be plain white, cream or beige. We have some great options here at Selwood Equine. The Tattini Kenzia full seat are available in either white or beige and the full seat in suede assist with security whilst in the saddle. The breeches are breathable, water and stain resistant too. Long boots or short boots and gaiters are permitted footwear and gloves too must be worn. Our Selwood logo saddle cloths are also permitted in the arena as they conform with the affiliated size rules – take a look at the large Selwood saddle cloth with the new logo! Competing over a course of jumping obstacles, including verticals, spreads, and double and triple combinations. Usually with many turns and changes of direction. The intent is to jump cleanly over a set course within an allotted time. 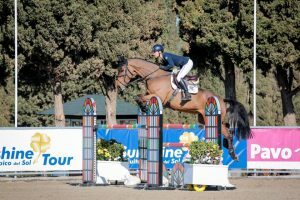 British Show Jumping advise that alongside a correctly fitted riding hat that meets current safety standards and that is designed to provide protection, the following must be worn. Traditional styled tweed or tailored riding jackets. Shirts; long or short sleeved with high collars. White, pale yellow or fawn breeches and long riding boots. The Tattini Ginestra breeches are both smart and comfortable and ideal for competition wear. The White breech with a dark navy stripe to the side are not only flattering but breathable soft and comfortable. The lycra leg inserts help to create a comfortable slim fit under boots too. Tattini also offer some great show shirts in either long or short sleeve versions. All shirts are machine washable and customers have given us great feedback on their comfortable style and fit. 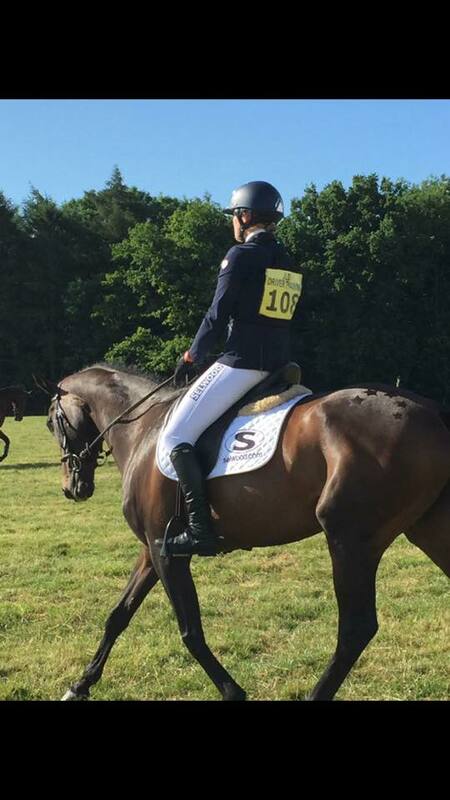 “…an endurance, accuracy and speed test that forms one of the three phases of the sport of eventing. Comprising fixed and solid natural looking obstacles built across ground that incorporate some of the natural elements you may find in the countryside. Such as water, ditches or banks”. British Eventing refer riders to the following clothing items that can be worn for the cross country phase of eventing. Correctly fitted protective head wear to the current standard with a cover. Riders cross country colours. White buff or fawn breeches. Plain black or brown leather boots or gaiters with matching boots. A body protector which is legal and to standard. Here at Selwood we have some great base layers that can be worn as part of your cross country colours under your body protector. We even have an option for you to personalise your base layer with your name or your horses name down the sleeve. The lightweight and soft base layer is easy to care for and super comfortable against your skin. Quick drying compression and helping to regulate your body temperature means that the Selwood base layers are a great choice for cross country wear. If it is comfortable breeches you are after for your cross country round then take a look at the Tattini Kenzia Platinum breeches. They are waterproof, breathable and stain resistant. Plus they have silicon gripping to provide the rider with a secure grip and extra stability to the knee area whilst riding. 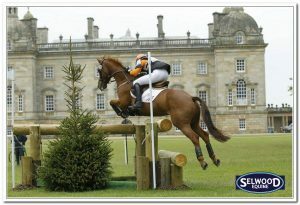 There are so many options for competition clothing available with Selwood Equine – jackets, shirts and breeches galore! If you are about to embark on the competition scene for 2017 we wish you all the very best of luck. We hope you have fun and enjoy yourself!